Biofeedback technology enables us to understand the workings of the human body and its psycho-physiological involvement in energy, emotions and physical health. The body’s internal communications through synaptic nerve connections determine and influence mental and physical states and now the science of Biofeedback will not only help you understand this for your client, but also adapt and enhance energetic states and well-being. By converting Biofeedback information into a digital imaging technology, Aura Imaging Centre has a system that correlates the measured biofeedback data with colourful, visual and easy-to-understand images that enhance understanding and awareness. Now you are empowered with the ability to visually see their Biofeedback interpretations of energy, health and emotions and also have the ability to change them with wellness services, products and therapies to experience results in real-time. The process is scientific, user-friendly and easy to understand for you. Biofeedback data of electro-dermal activity and temperature is measured from dozens of points on the left hand. The software then analyses the complex data based on empirical biofeedback, aura, chakra and energy research technology. The calculated information is then displayed onscreen in multiple formats and graphs to validate your wellness, energetic state and health. By displaying and effects of our wellness treatments to not only give you a better self-awareness in regards to your health, but to help you visualize the power you have on their own body and psycho-physiological wellbeing. The essential differences between our Aura Video Technology and standard biofeedback tools are the colours, shapes and other multimedia reports and images that show and visualise the measured data and information. This new technology goes beyond conventional science by correlating the measured data and information. 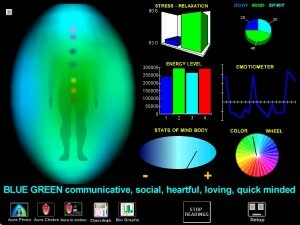 This new technology goes beyond conventional science by correlating the measured data to your aura and chakras. 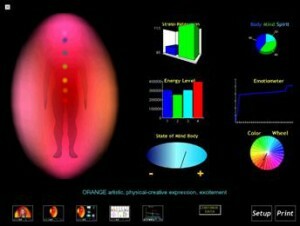 By displaying colours as a representation of your aura or energy field, we enhance the ability to understand the connection and impact of multiple wellness healing approaches with real-time, visual results to digitise, discover and deliver the most up to date and technologically sound methods of health and self-awareness.